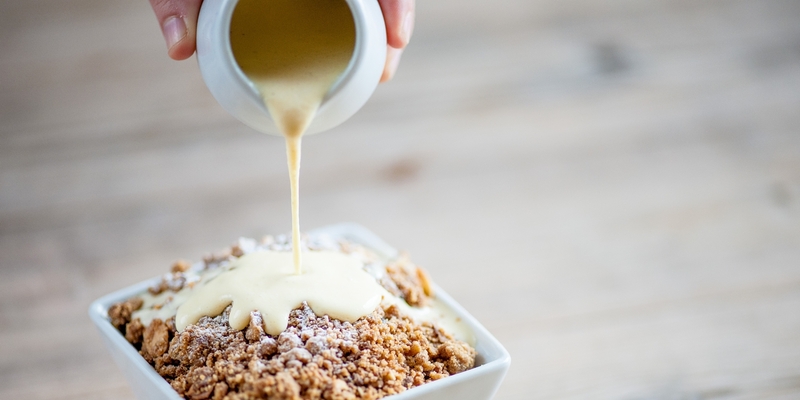 Custard is used as the base for many famous dishes such as ice cream, crème brûlée and custard tart, but is also used as a sauce in lots of other desserts - typically with a fruit crumble. The classic custard uses just egg yolks, sugar and milk/cream but other flavourings such as vanilla can be added. Tuck into this gorgeous collections of recipes using custard, including Dominic Chapman's gooseberry crumble, Paul Ainsworth's bread and butter pudding and for something a little different, James Sommerin's goat's cheese custard and asparagus.